I hope you have enjoyed this brief tour of Nova Scotia through our fine fictional creations. If you would like to explore additional Nova Scotia authors, have a look at The Writers Federation of Nova Scotia website. Here you will find lists of the latest books published by members of the Federation and lots of information and support for you budding authors out there. In The Parrsboro Boxing Club by Bruce Graham, Parrsboro begins and ends the story of Duff Martin's quest for boxing fame and for his father's approval. Mining has a long and complex history in Nova Scotia. It has both provided a livelihood and taken away loved ones. Twenty Six by Leo McKay was inspired by the Westray Mine Disaster in Plymouth, Nova Scotia. Set in Liverpool His Majesty's Yankees by Thomas Raddall takes a fictional look at the Nova Scotia reaction to the American Civil War. Truro, the hub of Nova Scotia, is also the hub of a murder investigation in Unexpected Ties by Gina L. Dartt. Kate Shannon and Nikki Harris are caught up in another mystery involving a very prominent and powerful family. Hopeful treasure hunters speculate whether Oak Island might contain Marie Antoinette's jewels or maybe Captain Kidd's treasure. In The Oak Island Affair by Jane Bow the mystery is rekindled in a 400 year old diary written by a Spanish Dominican monk. Dedicated to the six actual people who lost their lives searching for the treasure, Oak Island Code: An Almost True Story was written by D'Arcy O'Connor and Danny Hennigar. The book is written in dueling chapters - it's up to you to determine who wrote what and who is most likely to succeed. Keith Baker, an Irish writer, chose Lunenburg on Nova Scotia's south shore for his setting in the aptly titled Lunenburg. Two present day murders in Halifax have connections to a decades old murder in Lunenburg. 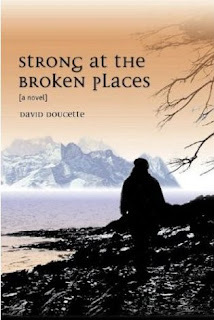 In Strong At the Broken Places by David Doucette a widow leaves her home in Ingonish to visit a friend in Vancouver, embarking on a new phase in her life. Small town life may not be what you expect. In Lucky Strike by Pat Wilson Eric Spratt moves to Nova Scotia's Eastern Shore in a witness protection-style attempt to make himself invisible and anonymous. He didn't anticipate the antics and not-so-wholesome doings of the locals. Conductor of Waves by Darcy Rhyno takes us back to Nova Scotia's South Shore. This is a collection of stories about growing up in a fishing village in rural Nova Scotia.